Some of us woke up on November 9 of last year and decided we needed to get a lot more politically active. But not Megan Hunt. The 31-year-old owner of Hello Holiday, a neatly-edited fashion boutique in Omaha's Dundee neighborhood, has long been an activist for issues such as family planning, equal pay and paid parental leave, and had already made up her mind to run for the Nebraska Legislature (District 8) well before the last election. "However people come into advocacy and activism is great," she told me when I asked about this. "But lasting policy change can't be a reaction. If I didn't have strong policy ideas and know that I'm the best candidate to implement them, I wouldn't waste my time running reactively." 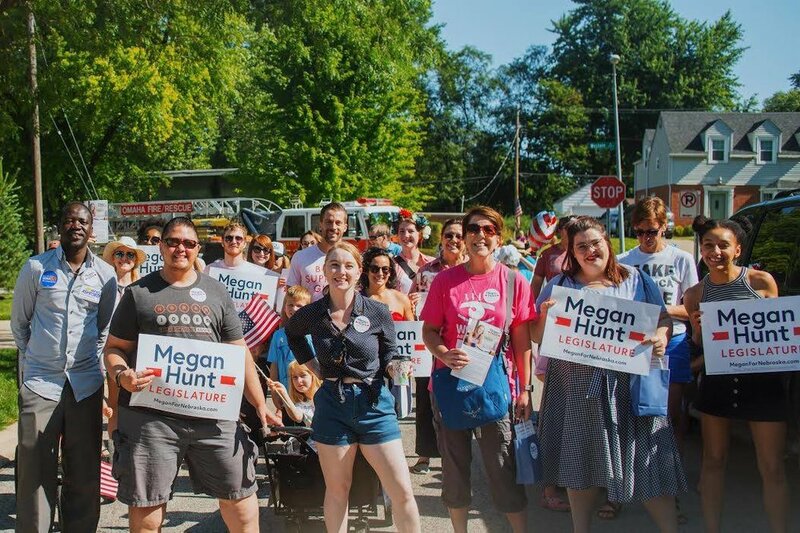 In fact, Hunt is looking forward to collaborating with state senators of all political stripes on issues such as tax reform, improving health care access for all and making public transportation more widely accessible. "Our unicameral gives us a unique opportunity to find bipartisan solutions," she says. "You hear senators on the floor talking about how people just need to pull themselves up by their bootstraps -- say, a single mother who can't get to one of her jobs because of systemic policies that have been in place for years just because no one has changed them. I want to help them see that social interventions are not incompatible with conservatism." Hunt also wants to take on environmental protection measures and making the state more appealing to businesses and young professionals. "It's good to see the world. But I want to help create a state people are happy to come home to -- and bring what they've learned with them." Hunt herself has never seriously considered a permanent move from Omaha. "My business is here. My home is here. I can walk my daughter to her great public school. I can walk to Blue Line to get my coffee every morning, then go to a store I own and sit in my pink office, surrounded by art. It's a good life." At the same time, she is deeply aware that she's had opportunities and privileges that not all Nebraskans enjoy. "Nebraska can be a difficult and even dangerous place to live if you are black or Latino -- or LGBTQ, or an older person, or disabled, or economically disadvantaged. It would be irresponsible of me to not use the access and advantages I've had to make the state a better place." Not that it's been all pretty dresses and bobo ideals. Hunt and her business partner helped get Hello Holiday off the ground with $3,000 that they earned by selling many of their own treasured possessions in a garage sale. She is a single mother who, at one point, was making $300 a month and depending on SNAP and Medicaid benefits. She supported herself and her daughter by renting out their apartment (and two others) on Airbnb -- estimating that she hosted about 1,000 guests over the course of four years. "I still keep in touch with many of them. I would tell them about all the great things to do in Nebraska and, by the end of their visit, they would want to come back and see the rest of the state." She's counting on that catchy, Homaha-enthusiasm -- plus her natural tenacity and work ethic -- to get her past any initial learning curves. "I've done a lot of testifying before the state senate, but there is a lot about this world that will be completely new to me... but it's new to everyone when they are first elected," she says pragmatically. Then, with that unapologetic determination that catapulted her through the lean years of starting her business and being a single mom, she adds, "If I'm good at this job, we can talk a promotion in eight years."